Sometimes you may have a file on your computer but you don’t have the necessary application to open it, or Windows doesn’t know which one to use. These “unknown” files are easily noticeable as they don’t display any recognizable icon, but use a generic symbol instead. The trick to open this sort of file is really simple: double click on it as if you were going to launch it and Windows will display a message to ask you for the appropriate application to open the file. Choose the “Select the program from a list” option and click on OK. On the next Window, move along the list of available apps or click on the “Browse” button to find the program you want to open this file with. 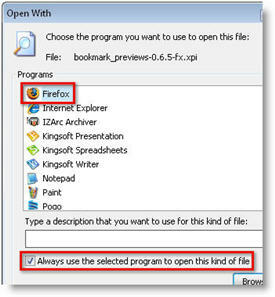 Once the program’s name is highlighted on the list, make sure the “Always use the selected program to open this kind of file” option is enabled and click on OK. Windows will automatically recognize the file type, and will use the application you’ve chosen to open it from now on. One last tip: if you ever want to change any current file association, right click on the file while holding the Shift key, and select “Open with…” in the context menu. This will bring up the program selection dialog again, enabling you to select another program with which to open those files from that moment on.